I have about 50 gallons of waste motor oil. Nearly all of which is Mobil 1 synthetic. The mix consists of 15-50 M1 from my turbo Miata + power equipment, 10-30 M1 From my Ford F150 (M1 since new, 200K now), M1 ATF from the Ford and some 5-40 Delvac 1 (M1) from my diesels. I decided to keep it in a series of mid sized barrels for the Listeroid. However, I ran out of room for more oil. So I took the oldest barrel, sitting for a few years and started siphoning the oil from the top. I let the siphon push it through a 0.5 micron Motorguard filter. It takes all night to get a gallon. The oil comes out charcoal amber, with an obvious clean look about it. (not that it was ever dirty). I mixed it at a ratio of about 1 to 3, oil/JetA. The results so far are staggering! The car runs very smooth, has much more power and is generally much more pleasant to drive. The throttle response is great! Some of this is due to the additional viscosity resulting in higher pressures. If effect changing the way the pump operates. Some of this may be due to the additional energy content of motor oil and some due to the effective cetane. I picked up about 10MPH top speed and a good bit of fuel economy too. 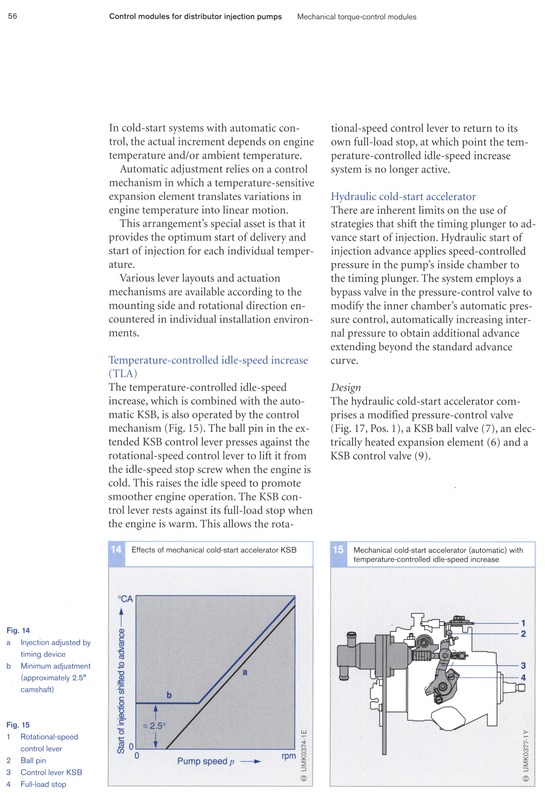 The car simply takes less throttle (oil) to cruise at any given speed. In any case, it is a welcome addition to my trusty Diesel Rabbit. Many people have "guessed' that synthetic oil won't work well, or won't burn well. I find just the opposite. The kerosene ignites very easily. Years ago when I serviced the fuel pumps at the air port I would come back wuth about 20 gallons of fuel and 20 gallons of ( give or take when I pumped the tank bottom ). The truck drivers were made for the stuff because it cleaned out the carbon they said. The heavier lube oils have a higher energy density, but they are sootier. You may notice you produce a little more black smoke when hard on the acelerator. One probably compliments the other very nicely at that ratio. 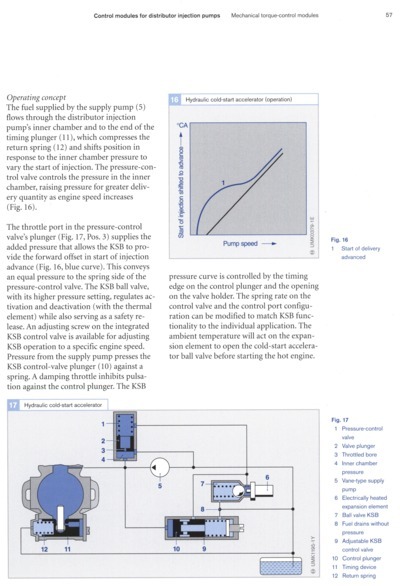 With the tolerances in an injection pump do you think that increasing the viscosity of the fuel would equate to higher pressures? If it was really whipped, maybe I suppose (and the chances of a 26 yr old Rabbit having a tired pump are pretty good too). Whatever the reason, It's good to know that the synthetic can be burned. Looking forward to hearing more down the road. No way of knowing the quality of the injection pump. I am sure the oil changes the way the pump works along with the injectors. However, that was not really my point. Discounting any pump changes, it runs really well. It runs clean, does not smell different, is more responsive and goes much faster. In fact, I am certain that it is quite a bit faster. Nothing I could do with the smoke screw (the rack limit, as it were) would make the car go this fast. The synthetic oil is working well with the JetA. So far. Not sure about carbon buildup. That could be a problem down the road. One cracked waste oil the 350 diesel in my chev 1/2 would build up a lot of sootin the exhaust. In Connecticut it's now $4.08/gallon for road diesel. i'll answer my own question. motor oil and methanol do not mix, form 2 separate layers. now back to the rabbit, any more results with the waste motor oil and the rabbit? moesoo diesel about 4.65/gal in san diego ca. The diesel rabbit ran quite well on WMO blended with Jet A. I am no longer driving it, as it does not have air conditioning. I ran it on straight Jet Fuel (with a bit of lubricity additive) on a road trip right before I parked it. The engine was nearing the end of it's life and it would not start after I got home, maybe due to low compression. We have since gotten it going and it starts just fine now. Not sure what happened with the Jet fuel, but it could have had some water in it too. My point is that the car was quite old and worn out. The WMO really did make it run better. I would not hesitate to use WMO again. As long as it is blended with clean fuel and very well filtered. AND the engine was not a modern expensive engine. I thought I would follow up with the teardown results. I stopped driving the car a while back. Bob (rocketboy) took the engine apart for overhaul recently. The carbon buildup was nothing unusual and there was no significant "thick" carbon anywhere. The only other VW diesel I have ever seen apart looked quite similar, and it ran on straight diesel. Obviously, the sample size is too small to draw a conclusion. However, so far it looks promising. My engine has more power and less smoke than on diesel. Listeroids are supposed to have the piston scraped after 700 hours I think. there was nothing to scrape on mine, just a little goo which was not there at 1000 hours when I pulled the head again. Still nothing to scrape. Some of this is due to the additional viscosity resulting in higher pressures. If effect changing the way the pump operates. 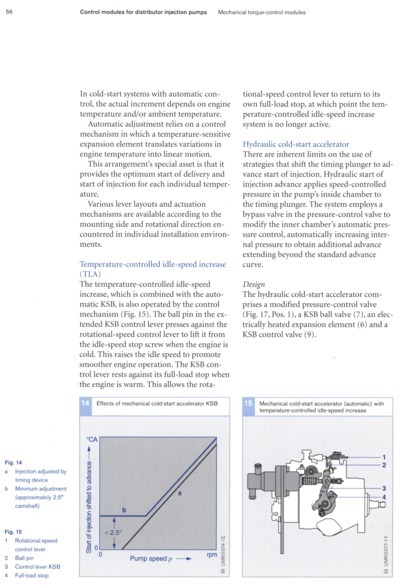 For those not familiar with the Bosch VE-style IPs (injection pumps), the automatic timing advance is purely hydraulic: there are NO mechanical flyweights to advance the injection timing at the RPMs increase. The lift pump is built-in to the front of the IP. It's a vane pump, similar to most power steering pumps. It serves two purposes: it pulls fuel from the fuel filter, and it pressurizes the IP's internals. There is a timing piston that reacts to the IP's internal housing pressure and it acts against the cam plate over which the plunger rollers move, changing the timing. This is all background: the Bosch VE-style IPs vane pumps have a pretty high wear rate, and gradually are unable to properly pressurize the housing, though they'll still work well enough to pull fuel from the tank etc. This means that the effective IP timing becomes retarded at the higher RPMs only. From my testing, this can't be detected with a Tach-n-Time, Ferret, Snap-On MT257, OTC, etc. piezo pickup injection timing setup, and probably not with an optical glowplug-hole pickup either, because Bosch engineered the VE-style IPs to not advance unless under load, and even then they have a feature they call Torque Control or something that retards the timing even under those conditions. Summary: higher viscosity fuel may change the timing of a worn VE-style IP in a positive direction and may be a variable in how well an alternative fuel works in an old diesel having a worn IP. 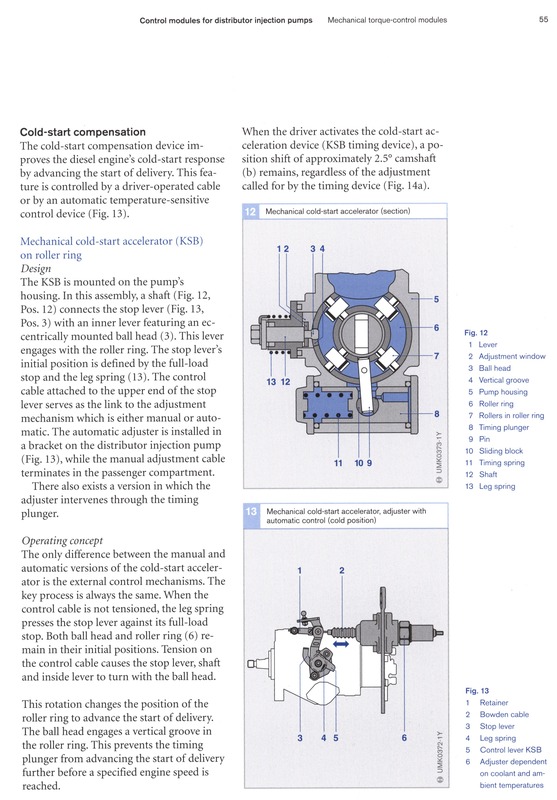 Most of this info comes from the Bosch "Distributor Type Diesel Fuel Injection Pumps" softcover technical "Yellow Book" from Amazon. It is slim, at 134 pages, but fairly dense. It is chock-full of illustrations that are better than average. It is also, unfortunately, a starkly translated manual and as such must be read with that in mind; it is very easy to misunderstand the intent of a statement, and this will lead you to incorrect conclusions that can be hard to bend back to reality later.